What Is The Email Copy Function? Sending a copy of your completed form by email to either the respondent themselves or a different admin can prove to be extremely advantageous. For example, if you wish the results of a form to be moderated by an independent user send an email copy of the form. Likewise, if you wish to send proof of purchase to your customer after a transaction, automatically set up the email copy function. Say you want to send out an email to a person who fills out your form, like a thank you email or a voucher for your customer's next purchase - with email themes can create automatic customizable email send outs when somebody completes your form. If you want multiple customized mailouts based on different responses you will want to visit email logic. If you’d like to design your own email theme, click the green plus sign in the top left corner of the theme manager. Once you have pressed the green plus button it will spin and give you two options; select > Email Theme. After clicking the Email Theme button you will be directed to the email theme creation page. Header Image — This image displays above the top of your email and is a great place to include a banner image. Background Color — This color will only appear if you do not have a background image set. Container Background Color — The background color of your container fields. Button Background — The main color of any buttons, including calendar and form submission buttons. Button Text Color — The color of any text and icons that appear within a button. 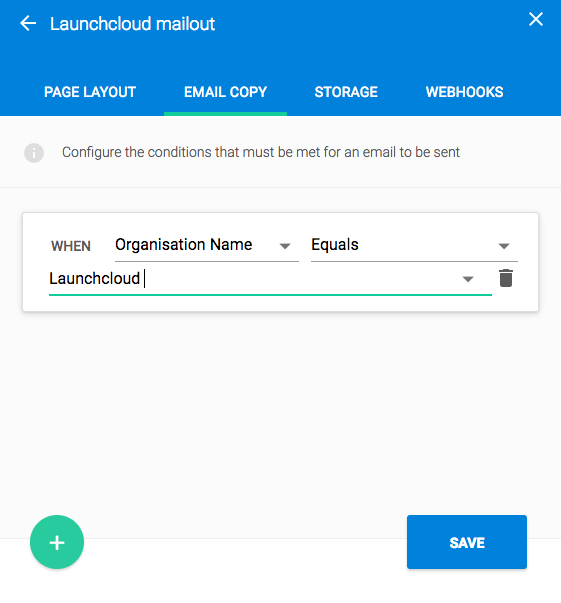 After you have completed the customization process, click the Done button in the bottom right corner of the page, this will save your email template and bring you back to the email themes page. If you would like to duplicate the theme you have just created > highlight your selected theme and press copy. Once you have built your form, you’ll want to click the setting cog in the top right corner of your screen. From here you will need to select EMAIL COPY and click the green plus button located on the bottom-right of the screen. Email Addresses - Any emails (usually for internal records) that you want a copy of every response sent to. The Format - The format of the copy of the completed form. To have images and documents attached which are present in your forms too, you will need to tick both of these options in your email settings for them to be included in your emails. Once you have done this, remember to press save, and you will now have fully automated customizable email responses to your forms. To send out different custom emails based on different individual form responses, i.e an email for a positive response and an email for a negative response - read below to find out about email logic. How do I Use Email logic? It is now time to set your conditions to determine who will be sent a response email and who will not. To do this, you’ll want to > click the green circle with the plus icon in the bottom left corner logic page (this will appear automatically after you save the last section). If you want to return later to the logic section of your email copy > go back to the email copy option > find your email title > and to the right click the email logic button. The choice of field conditions will then appear for you to set. For example, it’s the “Fail or Pass” field, so you’ll want to select “Fail or Pass” from the drop-down box. You’ll then need to specify which values are needed to trigger the conditional field. We’ll want a Pass selection from the user to trigger an email. When these conditions are set, press Save and your email logic will now be live. If you want to add another different response email (perhaps for a negative or positive response), choose a different email theme, and set alternative email logic. Email Copy is available to all Automate users, To make use of this feature, upgrade your account now!